Kinected: What brought you to Kinected full-time? Michelle Spinner: The chance to work side-by-side with some of the best people in the business, and the opportunity to develop the GYROTONIC® Teacher Training program at kinected. It also appealed to me to work in a spacious, light-filled environment. K: How have you seen the studio evolve? What has remained a constant for you? MS: The studio just keeps getting better. The focus on education and growth for the teachers, as well as the clients, means that everyone gets to explore their full potential. Creativity is encouraged, and many of us have developed our own classes, workshops, and courses. MS: There is a tremendous culture of “cross-pollination” at kinected. We all share what we know and what we discover with each other. We consult with each other regarding the clients that we have in common, so that the clients feel very well taken care of. Everyone is very supportive of each other. The focus is on learning and always what is best for the clients and our students. The close relationship that Kinected has with the medical community, especially the Anatomy Department at Mount Sinai Medical School, makes for tremendous learning opportunities, as well as excellent additional resources to offer our clients. K: How has the environment & resources here shaped you as an instructor? How have they challenged you? MS: All of the instructors at Kinected are smart — always growing and expanding their knowledge and experience. No one is resting on their laurels, which means that I always feel challenged and encouraged to step up my game. I have particularly enjoyed interacting with the Kane School students. It is fun and very rewarding to answer their questions and to help them acquire the skills they need to become teachers. It also keeps me on my toes when they observe my classes and private sessions. I want to be sure to set the very best example. K: What’s your favorite prop or piece of equipment? 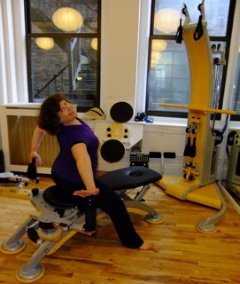 MS: I think I’d probably have to say my favorite piece of equipment is the Jumping Stretching Board – one of the GYROTONIC® “specialized” pieces of equipment. I love to work out on the JSB myself because it is fun and super challenging, and I can give myself a great workout in a limited amount of time. I love to teach clients on the JSB because the repertoire for it is vast. There are many great exercises for the beginner client, for the elite athlete and dancer, and for everyone in between. More staff features to come in August!